Last August I started working with the truly lovely Coleen, owner of Plank & Pearl Boutique Vintage Rentals, on marketing and business strategies for her growing business. Coleen turned her passion for treasure hunting vintage furniture, tableware, and other curiosities into a business serving weddings and events. However, she wanted to connect her business with the customer base that appreciates her collection and want to incorporate vintage into their wedding or special event decor. Coleen and I first met in early 2017 via the Rising Tide group Tuesdays Together-Denver and got together for what was a bit of a disastrous lunch. The conversation was good, but Coleen is vegetarian and we selected an Italian fast-casual restaurant with very limited vegetarian options. There was an uncomfortable undertone to the getting-to-know-you meeting, but the way Coleen spoke about her vintage event rental business I knew she was someone I wanted to work with. Month's later I got my chance when she posted in the Tuesdays Together-Denver Facebook group in search of "part-time marketing help for Plank & Pearl, especially focusing on strategy". Although my training is in graphic design, I've never been able to stop my mind from thinking about things in a strategic way. I was confident I could help Coleen refine how Plank & Pearl communicated with wedding vendors and Denver area engaged couples using high-quality design, proper messaging and consistency. So I raised my hand. Thrilled for the opportunity to interview for the position I dug into Coleen's website and social media communication, read up on marketing strategy and made a list of ideas to present to her. I happily shared my strategy ideas for her brand. My homework paid off, and I got the job! 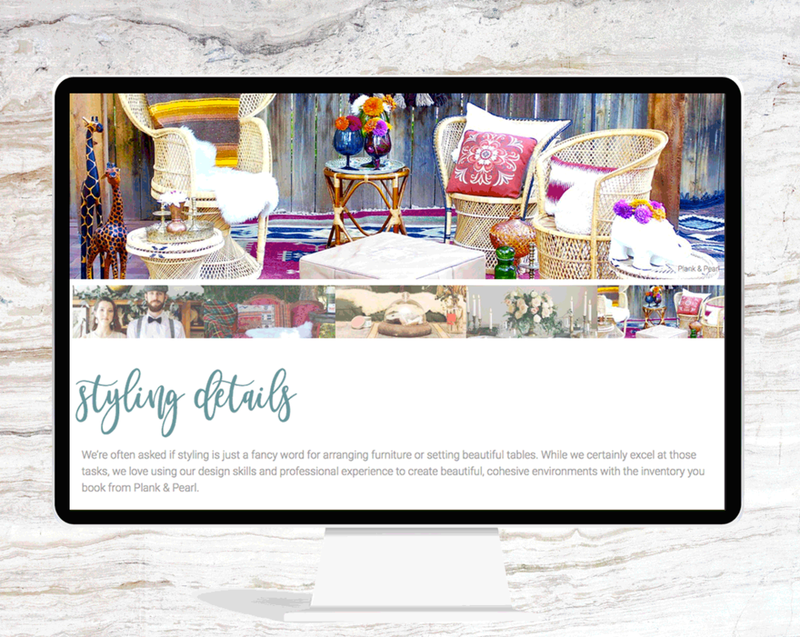 After creating a marketing plan and setting up business systems that would help her run her business more easily it was time to pay some much-needed attention to the Plank & Pearl website. We took the time to discuss her needs, research the competition and make an outline for the new website before starting on the design. Again, the time invested in putting together a thoughtful plan made the design phase a breeze. The wireframe design was approved for production and handed over to the talented developer Mitch Masterson of The Debacle Co to pull it all together in Wordpress, connect her inventory system and CRM platform. Coleen's new website communicates her passion for vintage and love for weddings and parties! It's making the connection between herself and her customers; local engaged couples and the wedding vendors who help them plan fabulous weddings. It features the individual pieces available for rent, provides details about her policies and outlines her services. I've been inspired by Coleen's passion for Plank & Pearl from the beginning and am extremely proud to work with her. Even more, I'm excited to see her business growing!